My brother whom my father lived with texted me yesterday offering me one of my dad's 3 guitars. 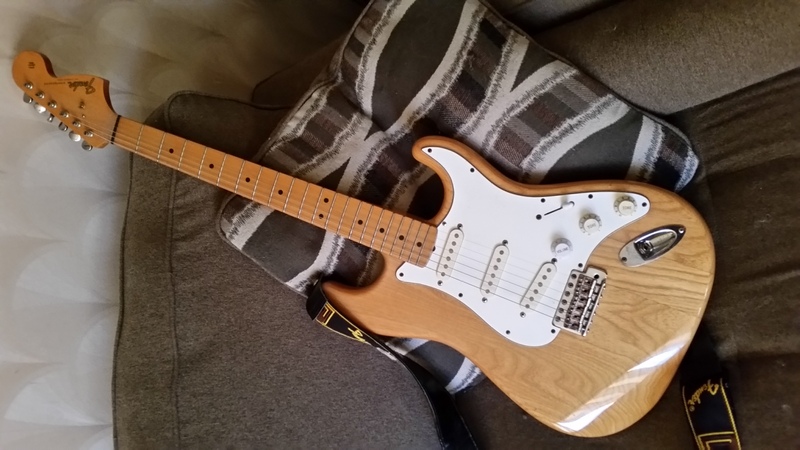 Today I chose the one I always picked up when I visited him, a 90's CIJ 70's ST67 Stratocaster (my other choices were a lefty partscaster and a Starcaster by Fender strat.) When he first got this one I did a thorough setup on it and fixed some of the wiring. I'm not usually one for Strats but it's a great player and under the circumstances might become my main for a while. I hope that someday one of my sons or daughters will have the same appreciation for my collection. It's a beautiful guitar. I really like the natural on natural. Maybe someday you'll pass it down to someone else in your family and so on and so on. That's a beautiful thing. Make sure you enjoy at more than it makes you sad. Love 70s strats, and love having a thing that someone special to me has spent some time enjoying. As a sidenote, every time I moot selling/trading my Firebird, my son goes "OH NO, NOT THE FIREBIRD". I like the the that it'll be his one day. That's really quite* cool. Matt would like several of mine... mind you, his priorities might have changed by the time they become available. We do have my father's Spanish guitar but it's not a good one. *Understated British way of saying "extremely"
Play it with love Nick, it's a very cool instrument. The torch has been passed. Is it a 3-bolt or 4-bolt? It doesn't have the bullet truss rod. If I'm not mistaken that's actually a '68 RI, my best friend growing up got a lefty one otherwise identical around the time I got my CIJ Jag. It differs from the '70s reissues as Jcyphe says: no bullet and a 4-bolt neck. It was basically the affordable Hendrix option at the time, with the 30th anniversary of Woodstock yielding a variety of Voodoo (flipped bridge pickup and headstock) and fully-reversed Hendrix sig models elsewhere in the Fender catalog. THINK it's one of the CIJ 68s - big headstock like a 70s ri, but no bullet, and a four bolt plate. Think Thom/Ultra have the same model. It's a 4 bolt. Built in 97 I believe. Maybe I'm wrong about the model, but it does have the vintage style Klusons and a big headstock, looks like 9.5/medium jumbo frets. I'll take some better photos once I get it cleaned and setup. Interesting so it does have a lot of late 60's features. I like the guitar. I am trying to get my knowledge up on all the Japanese variations of re-issues but there are so many. love it man.. it's very you. Hope you're doing OK, Nick. I must've missed on whatever news makes this sad...my condolences anyway...but, nice guitar. I would say it's probably more accurately a '66-67 RI. The gold logo is the giveaway. But there was so much variation with Fender of Japan during that time that personally I can't honestly say for sure (certainly no expert). And much variation with CBS Fender after the transition, too...I'd bet some '68s have the gold logo. Also, the black nut is probably not original, so I'd be curious to know if there are any other mods. Though I guess if you've seen the wiring, you know already. It was my father's, he died in April. I think you're right, it seems the 68 RI is more common and possibly identical other than the decal, but after reading your post I did some searching and it seems that they did make a CIJ ST67 between 96-97 at least, maybe it was a 30 year thing with Fender, I know they like anniversaries. From what I understand though Fender didn't actually offer natural finish strats until the 70s so even this is not quite accurate. The nut is not original and appears to be graphite. There is a little bit of overhang and it isn't sloted very deep so I may replace it. To my knowledge it's the only non-original part of the guitar. It's missing the inner string tree and the original back plate. I think I'm going to drop it at my local shop for a good setup. It's been a long time since I setup a strat bridge and I don't like doing my own setups. I love setting up strats. I think it's because my Jagmaster was the guitar I learnt to do all that stuff on, and it reminds me of being a kid and tinkering and experimenting. I love setting up strats. Same here. Such a well designed guitar. From what I understand though Fender didn't actually offer natural finish strats until the 70s so even this is not quite accurate. I remember being surprised to see a natural finish Strat in a shop in Bielefeld in 1973. I nearly bought a Tele in that shop but got a better deal on my Strat elsewhere. Me too. I actually get excited about it.